This year's Toys R Us closure is impacting Christmas shopping and Toys for Tots campaigns across the country. Kansas City's local chapter was left to pick up the slack spending nearly $18,000 in one week on toys. KANSAS CITY, Mo. 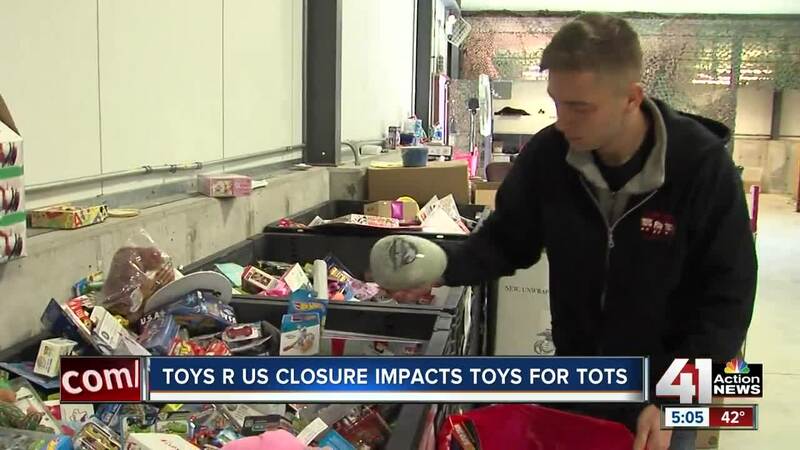 — This year's Toys R Us closure is impacting Christmas shopping and Toys for Tots campaigns across the country. Kansas City's local chapter was left to pick up the slack spending nearly $18,000 in one week on toys. The age group needing help runs from 8 to 16 year-olds. "Sometimes they don't think about those older kids who come downstairs on Christmas morning, they get excited just as well to have a present under the tree," said Toys for Tots Kansas City Gunnery Sergeant Roger Ruiz. Beginning Oct. 1st, Toys for Tots started collecting for the holiday season, but it was only newborns to 7 year-olds covered in the local program. Last year, Toys R Us shoppers donated more than 250,000 toys and the company gave millions in corporate contributions. The donations made up 40 percent of all corporate giving to the Marine Corps community effort. Despite the toy giant's decision to close, Toys for Tots Kansas City filled every gap, ensuring no child goes without a gift this Christmas. "It's been a little nerve racking, but now it's definitely a good feeling, and can definitely take a sigh of relief that we've made our goal and we're doing extra now," said Ruiz. The program collected nearly 25,000 toys to be distributed and filled over 200 requests from organizations throughout the metro area.